Manchester United lost at home to Barcelona at home in mid-week and barring a miracle in Nou Camp, they know their best way of making the Champions League next season is by finishing in the top 4. They play West Ham United at Old Trafford which is a must-win game for the Red Devils after a forgettable outing against Wolves in their last league game. Goals have been difficult to come by for Ole Gunnar Solskjaer’s team and that has become a major worry. After the euphoria of the honeymoon period, the new Norwegian boss is getting to know the harsh realities of managing a top side. Manchester United vs West Ham United - Live Football Score. Ander Herrera and Nemanja Matic are both injured and will take no part in the game against hammers. Although the kind of form Fred and Scott McTominay showed against Lionel Messi and co, their absence should hardly be felt. Fullbacks Luke Shaw and Ashley Young are suspended for the contest and Solskjaer may draft either Marcos Rojo or Phil Jones as a makeshift left-back with Diego Dalot as the other wide man. Anthony Martial and Jesse Lingard could both feature for the home side with out of form striker Romelu Lukaku making his way out. Juan Mata who has found playing time difficult to come by may also get a look in. The Hammers have as many as seven first-team players missing the trip to Old Trafford which is a huge blow for coach Manuel Pellegrini. The likes of Samir Nasri and Jack Wilshere have been on the winning side against Manchester United earlier and their experience would have come in handy had they been fit. Javier Hernandez will lead the away team’s attack against his former club in a stadium he has very fond memories of. Pablo Zabaleta is all set to be recalled by Pellegrini after being ignored for the last game. It will not be easy for Manchester United but playing at home should give them enough lift to cross the finishing line. When is Manchester United vs West Ham United, EPL 2018-19 Football Match? Know Date, Time and Venue Details. In the English Premier League (EPL), Manchester United and West Ham United face-off on April 13, i.e. Saturday. The football game will take place at the Old Trafford, with the start time of 10:00 pm (IST). Where to Watch the Live Telecast of Manchester United vs West Ham United, EPL 2018-19 Football Match? The official broadcaster of the English Premier League in India is Star Sports. So the fans will be able to catch Manchester United vs West Ham United live match action on Star Sports Select 2 and Star Sports Select 2 HD channels. If you are looking where you can watch the online streaming of the match, then you can log on to Star Sports' live streaming service, i.e. Hotstar. 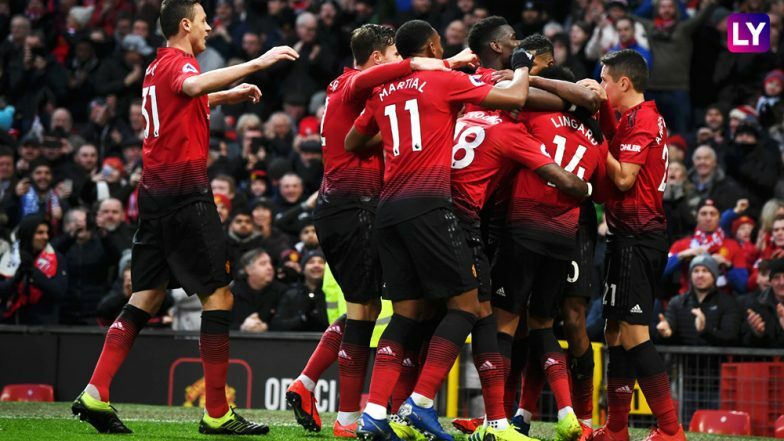 You can also catch Manchester United vs West Ham United live football score updates on LatestLY, by clicking here.